Most of us are familiar with the good work of animal welfare organizations like the SPCA, but there are also many dedicated individuals who have taken it upon themselves to help homeless animals in their own unique way. Camellia Saunderson has differentiated herself from the pack by helping dogs of certain breeds who often fall into the wrong hands like American Pit Bull Terriers, American Staffordshire Terriers, Boxers, Bull Dogs and Rottweilers. Named after her own loveable Pit Bull, Buddy’s Bully Rescue is on a mission to find homes for misplaced and misunderstood dogs who, despite their origins of being farm herding and cart dogs (Rottweilers) and nanny dogs (Pit Bulls), have gotten a bad rap for being bullies. “Unfortunately many people take advantage of these breeds’ size and strength and use them as, protection, status symbols or for illegal fighting,” says Camellia. One by one, Camellia trains and rehabilitates her rescues transforming them into the well socialized, loving, family dogs they were meant to be. While Camellia is the driving force behind her rescue, she has had the help of her partner, Luke Therrien, and many other supporters who have been instrumental in providing temporary accommodations, grooming, training, adoption coordination and endless fundraising for Camellia’s cause. 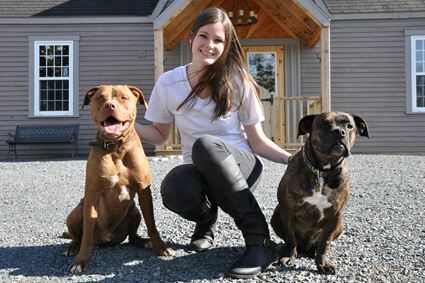 Dances, auctions and spa days are only a few of the initiatives that have raised enough funds to feed, house, train and provide veterinarian care for the 71 dogs Camellia has rescued since April 2013. This September, Muddy Paws Adventures is going to do its part to help these pooches by hosting “Trails ’n Tails”, a 90 minute fundraising hike for humans and canines in support of Buddy’s Bully Rescue and Mental Health. More details on our ‘good for the mind, body and soul’ fundraiser coming soon! 1. In tests conducted in 2009 by the American Temperament Test Society, bullies scored better than several breeds that are rarely associated with aggression, including beagles and collies. 3. The Centre For Disease Control and Prevention estimates that nearly 4.5 million people in the United States are bitten by dogs each year, but bully breeds are less often to blame than many other breeds. To date, there is no scientific proof that bullies are more commonly involved in fatal attacks than all other dogs. 4. There is no actual evidence to suggest that bully breeds are a riskier adoption choice than any other types of breeds. For more information on Buddy’s Bully Rescue and their adorable adoptables visit buddysbullyrescue.vpweb.ca.